Who ever destroyed yet another religious and historic Mesopotamian jewel, the US and UK, Bush and Blair are totally responsible. Iraq’s wonders have survived through turbulent history, but not through the illegal invasion. Amr Moussa, former Egyptian Foreign Minister and then Secretary General of the the Arab League, warned at the time that if Iraq was invaded “the gates of Hell will open” but the two about to become war criminals knew better. US troops allowed the looting of the Iraq Museum, the National Library, they near destroyed Babylon, damaged ancient, haunting Ur, believed birthplace of Abraham, Father of Islam, Christianity and Judaism. In Mosul Jonah’s Tomb and Mosque, the Museum and the city’s Libraries, which between them had works dating back to 5,000 BCE are destroyed. The list is without end as Iraq’s history, homes, families are decimated in order to “liberate” it. Since ISIS get their funding and weaponry from the US and it’s proxies in the region, whether it is the “allies” or ISIS erasing the wonders bequeathed by the genius of those millennia ago, the responsibility lies squarely at the feet of the American and British regimes. It is past time for war crimes trial for all responsible, from 2003 to now, with Bush and Blair first in a very long list. Iraq on Wednesday blamed the Islamic State group for the destruction of the Grand al-Nuri Mosque of Mosul and its famous leaning al-Hadba minaret, an act described by the prime minister as a “declaration of defeat”. However, IS swiftly issued a statement via its Amaq propaganda agency blaming a US strike, but the US-led coalition condemned the destruction as a crime against “the people of Mosul and all of Iraq”. Iraq’s prime minister, Haider al-Abadi, called the destruction of the mosque an “official declaration of defeat” by IS. “The Daesh (Islamic State) terror gangs committed another historic crime by blowing up the al-Nuri mosque and its historic al-Hadba minaret,” the Iraqi military statement said. 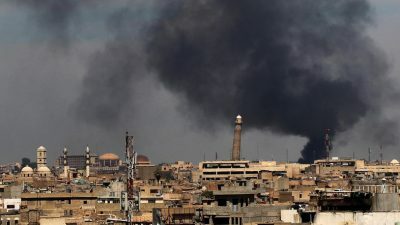 The explosions happened as Iraq’s elite Counter Terrorism Service units, which have been battling their way through Mosul’s Old City, got within 50 metres of the mosque, the statement said. Iraqi forces earlier on Wednesday said they had started a push towards the mosque. A US-led coalition is providing air and ground support to the Mosul offensive which began in October 2016. On Tuesday, the forces had encircled the militant group’s stronghold in the Old City, the last district under their control in Mosul. 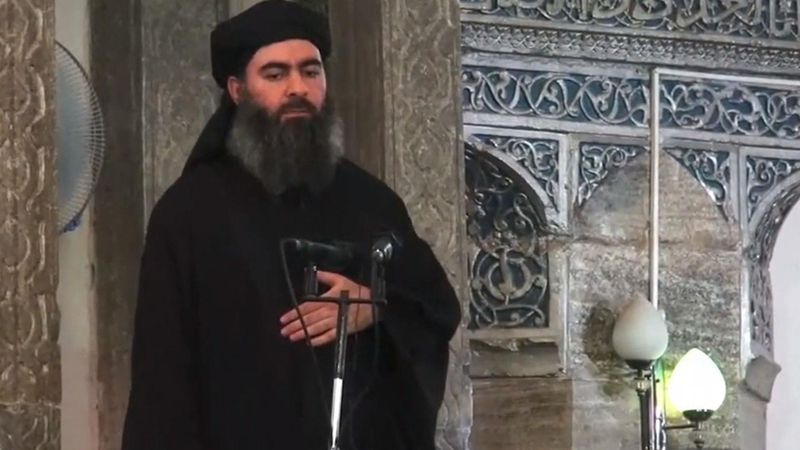 Al-Baghdadi proclaimed himself “caliph,” or ruler of all Muslims, from the pulpit of the mosque on 4 July 2014, after the group’s fighters overran parts of Iraq and Syria. His black flag had been flying over its leaning minaret since June 2014. Iraqi officials had privately expressed the hope that the mosque could be captured in time for Eid al-Fitr, the festival marking the end of Ramadan, the Muslim fasting month. The first day of the Eid falls this year on 25 or 26 June. The fall of Mosul would, in effect, mark the end of the Iraqi half of the “caliphate” which was the largest they had control of in both Iraq and Syria, but IS would continue to control territory west and south of the city. The mosque’s destruction came during the holiest period of the Islamic holy month of Ramadan, its final 10 days. The night of Laylat al-Qadr falls during this period, marking when Muslims believe the Quran was revealed to prophet Muhammad. Baghdadi has left the fighting in Mosul to local commanders and is believed to be hiding in the border area between Iraq and Syria, according to US and Iraqi military sources. IS has destroyed several key heritage sites in Mosul, including the main museum and shrines to Jonah and Seth. “The minaret of al-Hadba has been here forever, it is part of the history of Mosul, it is the symbol of the city,” Ahmed Thilij Hamed, a 49-year-old resident near the Old City, told AFP on Monday. It had become clear to most in Mosul that IS would not give up its last redoubt in the city without destroying landmarks whose capture by the Iraqi forces would have dealt them a massive symbolic blow. Staff Lieutenant General Abdulwahab al-Saadi, one of the top commanders of the Counter Terrorism Service, said he thought the Nuri mosque and nearby “al-Hadba” would almost inevitably be destroyed. “The mosque has some symbolism for the terrorist gangs, being the mosque where Baghdadi gave his first sermon” as IS leader, he told AFP on Monday from his command post on the edge of Mosul. “Daesh might blow up these heritage landmarks for psychological reasons,” he said. “Perhaps they won’t want to leave this place that Abu Bakr al-Baghdadi took to the security forces and maybe they’ll send a message accusing Iraqi units of of destroying them,” he predicted. The mosque was named after Nuruddin al-Zanki, a noble who fought the early crusaders from a fiefdom that covered territory in modern-day Turkey, Syria and Iraq. It was built in 1172-73, shortly before his death, and housed an Islamic school. By the time renowned medieval traveller and scholar Ibn Battuta visited two centuries later, the minaret was leaning. The tilt gave the landmark its popular name: the hunchback. It was built with seven bands of decorative brickwork in complex geometric patterns also found in Persia and Central Asia. Nabeel Nouriddin, a historian and archaeologist specialising in Mosul and its Nineveh region, said the minaret had not been renovated since 1970, making it particularly vulnerable to blasts even if it was not directly hit.